A small galaxy called NGC1052-DF2 was previously thought to lack dark matter. A new paper suggests it might have dark matter after all. A galaxy that is supposedly devoid of all dark matter might actually be full of it. And that, paradoxically, could mean dark matter doesn't exist. What?! Back in March, a team of astrophysicists published a paper in the journal Nature claiming to have found a galaxy lacking dark matter — a hypothetical form of invisible matter that seems to exert gravitational pull without interacting with light. Scientists have suggested the existence of this bizarre matter to explain a just-as-bizarre phenomenon: Based on the light astronomers can see with their telescopes, the universe acts like there is much more mass, and therefore much more gravitational force, than Albert Einstein's theories predict based on what we can see. The Nature paper was big news. It would have been the first such object ever found in the universe. Moreover, it seemed to deal a death blow to an alternative theory explaining the weirdness of the universe: In that theory, gravity itself just acts a little differently than we (and Einstein) thought. If gravity is a little different than Einstein's equations suggest, then it should be different everywhere in the universe — including in this seemingly dark-matter-free galaxy — not just in some places. Now, a second team of physicists has posted a paper to the preprint journal arXiv claiming that this galaxy acts as if it has dark matter after all. If true, that would mean that the leading alternative to dark matter might still be true. However, the new arXiv paper hasn't yet been peer reviewed, and the authors of the March Nature paper don't agree with the second paper's conclusions. Dark matter or something else? The original paper from March based its stunning claim of a dark-matter-free galaxy on the way clusters of stars moved through the thin, diffuse galaxy called NGC1052–DF2: They appeared to move at exactly the speed Einstein's equations of general relativity would predict based on the visible matter (so, slower than they would if the galaxy held dark matter). This new paper on arXiv suggested otherwise: First, the authors pointed out that NGC1052–DF2 was already discovered way back in 1976 and has previously been referred to by three different names: KKSG04, PGC3097693 and [KKS2000]04. Then, using those names and then finding all the available data on the galaxy, the researchers argued that the researchers from the March paper simply mismeasured the distance between that galaxy and Earth. This means the galaxy is probably much closer to us than the original researchers thought. However, Pieter van Dokkum, an astrophysicist at Yale University and the first author of the March Nature paper, said the new arXiv analysis is flawed. "The key distance measurement comes from the Hubble Space Telescope data, and it looks like they misinterpreted it. The argument is a bit technical, but essentially, they mistook pixel variations for individual stars. If NGC1052-DF2 were as close as they claim, then the galaxy would be resolved into a sea of individual stars," but it's not, Van Dokkum told Live Science in an email. However, Ignacio Trujillo, an astrophysicist at the Instituto de Astrofisica de Canarias and the first author of the new arXiv paper, said he and his colleagues stand by their estimates. Many individual stars can be seen in images of NGC1052-DF2 when the contrast is changed in images, Trujillo told Live Science in an email. In addition, "our paper not only uses a criteria for estimating the distance to the galaxy, but up to five different (and completely independent) methods, and all of them converge to the same number," he said. There's something deeper going on, though, than a dispute about the movement in a small, faraway galaxy: a fight about the existence of dark matter itself. 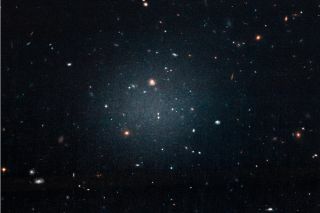 Researchers who argued that NGC1052–DF2 (or DF2 for short) doesn't contain dark matter were seen as offering evidence that dark matter really does exist in the universe — remember, the alternative theory needs gravity to behave differently in all places. Since at least the 1980s, a group of astrophysicists has argued that the whole idea of dark matter is faulty science, as Live Science reported in March. The dark matter proposal is essentially an untestable idea, these scientists argue, that can be speculated about forever but never disproven. And while researchers have seen some indirect evidence of dark matter in addition to its pull on distant stars and galaxies, they have never captured a single fragment of the stuff or otherwise directly demonstrated its existence, skeptics have argued. Most dark-matter skeptics are interested in the alternative theory, in which gravity is a little off-kilter. Called "Modified Newtonian Dynamics" (MOND), the theory suggests a suite of tweaks to the laws of physics at galactic scales that eliminate the need for dark matter. If the true laws of gravity are just a bit different than what you'd currently find in physics textbooks, these scientists argue, perhaps dark matter isn't necessary to explain the behavior of the universe after all. When the paper on NGC1052-DF2 came out in March, it was presented as MOND's death knell. Finding one galaxy without dark matter doesn't disprove the existence of dark matter, just like a desert doesn't disprove the existence of lakes. But MOND doesn't have that luxury; if the modified physical laws are real, they have to be consistent throughout the universe. In other words, if one galaxy follows non-MOND laws of physics without the influence of dark matter, then MOND can't be true. For that reason, DF2 "looks on the surface to be another nail in the coffin of MOND," Kathryn Zurek, an astrophysicist at the Lawrence Berkeley National Laboratory in California, who did not work on either paper, wrote in an email to Live Science in March. That was how most physicists reacted. Stacy McGaugh, an astrophysicist at Case Western Reserve University in Ohio, who has worked on both dark matter and MOND but did not work on either recent paper, was skeptical. In a follow-up interview in April, McGaugh told Live Science that the DF2 claims didn't account for the "external field effect" — a MOND tweak that would allow a large nearby galaxy to influence DF2's behavior — suggesting that MOND hadn't suffered the blow some had suggested. He also said the DF2 claims were based on some questionable statistics: The researchers measured the speed of just 10 objects in the galaxy in order to calculate DF2's overall velocity, excluding one object that behaved very differently from the others. McGaugh said that excluding anomalies is sometimes reasonable but that in this case, his calculations showed that including that very different object changed the paper's conclusions dramatically. With the object left out, the galaxy is inconsistent with MOND. With the object included in the calculations, the whole galaxy looks a lot more normal, McGaugh said. Now, with this new arXiv paper, which still hasn't been reviewed by peer scientists, there are new arguments against a dark-matter-free galaxy — and the very existence of dark matter — but these arguments have spurred additional arguments. The dark matter saga continues.